Hi all! I'm new around here, but I'm super excited to do my first wizard jam! (I only started listening to the cast a little over a year ago, and in that time listened to all of idle thumbs and important if true, just in time for the 3rd(?) death of the podcast.) I have very limited game development experience, so I'm trying to keep this project small, and hopefully, completeable. With that said, welcome to In The Shade of the Puffin! 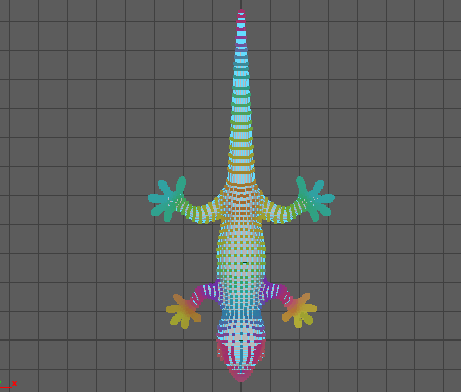 You play as a small, nocturnal gecko who overslept and has to get back to a dark area, avoiding sunlight. Fortunately for you, you live near a puffin nesting ground, and there are puffins running back and forth constantly. If you can just stay in the shadow of the puffin, you can make it to a nice, dark cave safely! It's a 3D runner, in the style of subway surfers, a mobile game I had never heard of until I googled "3D runner." Basically, you move forward on a track in a 3d space, moving left/right to avoid obstacles and get pickups. However, you have the additional constraint of always remaining within the shadow of the puffin, as you are nocturnal, and the sunlight reduces your HP. Most of these types of games are infinite and procgen, but I'm thinking of just doing a few levels by hand in order to allow for a curved track with cool looking terrain surrounding it. Good Puffin content and welcome to the forums! I'm having kind of a hard time envisioning how this'll play. Mainly about staying in the shade of Puffins running back and forth, might it not make more sense to have the Puffins' flying overhead? So you'd see their wings-spread silhouette on the ground and have to stay within it? Anyway, I look forward to seeing how it turns out. Thanks for the welcome everyone! Henke, I'm definitely considering having the puffin fly instead of walk, it will probably make the game play better. I've made the mistake I often make when starting a project, which is deciding to try to do everything myself, from the ground up, and as well as possible, without having any experience doing it. 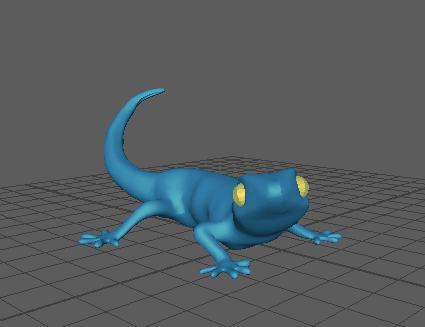 That is to say, I decided to model, rig, animate, and texture the player character gecko, despite having only modeled a few things before, and never rigged/animated everything. Of course this took longer than expected. 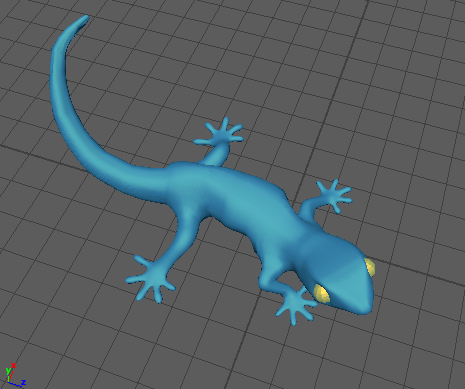 I spent the last few days on modelling and rigging this gecko, and it actually doesn't look bad? I'm struggling with painting skin weights near joints so that it's not a disaster, though. On one side, it finally looks acceptable. 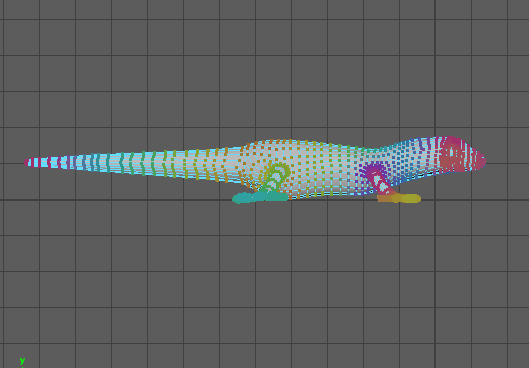 If anyone knows how to mirror skin weights in Maya, I'd appreciate some help, because I cannot get it to work, and I really don't want to try to exactly replicate it by hand. 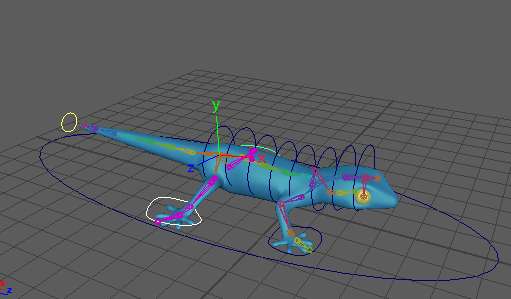 Anyways, now I have to give it a walk cycle, and then ... *checks notes* ... oh, then I just have to make the whole video game! Whoops. Here's some in progress pics, and hopefully I'll finish this soon so that I have time to make a game to put it into. Second: I've taken a break from learning animation in 2 days to actually start making a framework for the game. Most runners are a.) infinite and b.) in straight lines, which basically means that they are procgen. I really wanted to have some verticality and turns in this game though, so I decided to do a few handmade levels instead, but then I had to figure out how to keep my character on a non straight path. My solution for now is to use Cinemachine, a unity package made for improving camera movement in game and in cutscenes. I've been experimenting with using its dolly feature as a rail for the character to be constantly moving on. 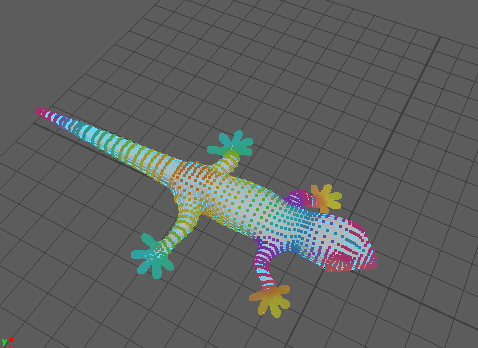 I figured I can parent an empty game object to the dolly, then make that the parent of the camera, gecko, and puffin (shadow), which can then move left/right without separating from the path or each other. I ran into a problem with the camera, which is that if the camera only turns when the character turns, the turn looks very sudden, and you can't see the path ahead of you. 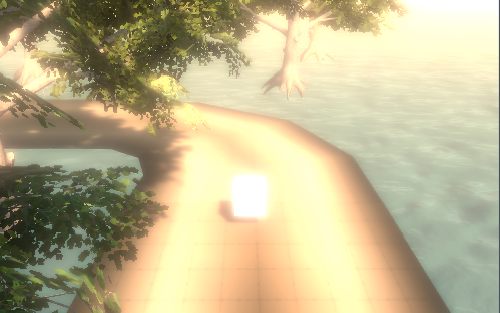 So I created an invisible object that follows the same path, but offset by a few feet ahead, and had the camera follow that, while looking the the character. This causes the camera to turn before the character, and sort of pull out into a wider arc that I think looks pretty cool. So far, this tactic has been successful! I've also been thinking: since you play as a nocturnal animal who is out during the day and has to stay in shadows, I was thinking of representing this by having just, absurd amounts of bloom, so you basically can't see much outside of shadowed areas. I'm seeking feedback on this because I'm not sure if this is a cool idea or if its just going to be annoying to play. 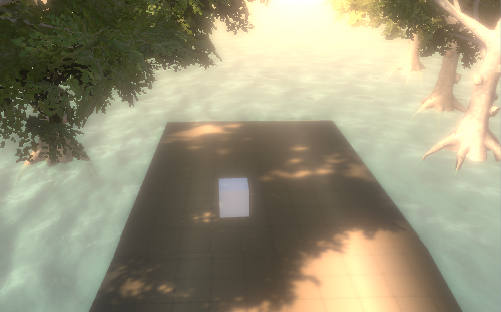 I've attached screenshots of a prototype below. This is looking really good. I love that washed out bloom look and that it is justified by your premise. That's a damn fine gecko!